In the digital age of texting and online social networking, “writing” is no longer confined to the assignments students get in the classroom. Many teachers are still trying to define these new forms of writing and to determine what impact they have on the “formal writing” students do in class. But most agree that students define “writing” as assignments they are required to do for school, not posting status updates or tweets. 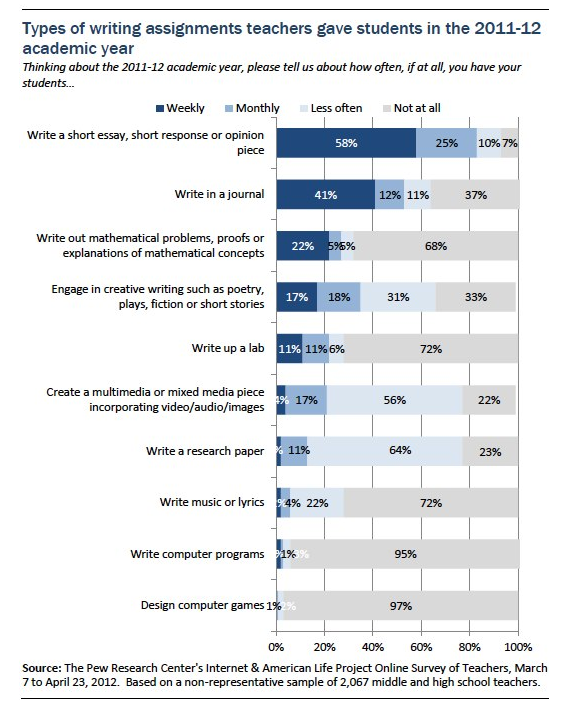 In a Pew Research Center survey conducted in the spring of 2012, 58% of teachers said they had their students write short essays, short responses, or opinion pieces at least once a week. A quarter of teachers only made these assignments monthly and another 10% made them less often than that, with 7% making no writing assignments at all. The next most frequent writing assignment, reported by 41% of teachers, was to ask students to write in a journal at least once a week. The type and frequency of written work assigned is highly dependent on the subject matter being taught. Among math teachers, for example, 81% report having students write out mathematical problems, proofs or concepts on at least a weekly basis. Among science teachers, 51% have students write up labs at least once a week and 56% have students write out mathematical concepts or problems. All of these percentages are much higher than those for teachers of other subjects. But when it comes to lengthy writing assignments, science and math teachers lag behind. Fully 94% of English teachers and 83% of history/social studies teachers had their students write a research paper during the 2011-2012 academic year, compared with 68% of science teachers and 36% of math teachers. A similar pattern emerges for multimedia or mixed media assignments, with English (84%) and history/social studies (82%) teachers most likely and math teachers least likely (51%) to have given their students this type of assignment in the prior academic year. Science teachers (70%) fall in the middle.